Collett, P. (2014). Researching self-regulated learning and foreign language learning. Studies in Self-Access Learning Journal, 5(4), 430-442. Self-regulation of learning is a topic of increasing interest for foreign or second language educators. Understanding how we can help our learners develop the strategies and capabilities that contribute to self-regulated learning (SRL) requires a firm grounding in existing research and theory, and a commitment to researching and testing potential methods within the situational contexts of the learning environment. Ensuring valid, replicable research results requires attention to a number of important factors in research design and implementation. 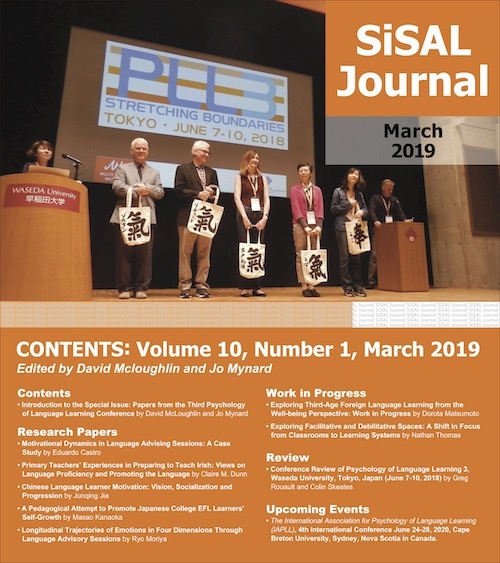 This article provides an overview of some key issues of concern for research, ideally serving as a starting point or guide for those interested in expanding our knowledge of best practices for enhancing SRL in the language learning classroom. Self-regulated learning (SRL) has been an important area of research in the fields of education and psychology over the last few decades, but is still a relative newcomer to the foreign language learning (FLL) sphere. As this special issue shows, a diverse range of research is attempting to uncover how SRL can help our learners develop as language learners, both in traditional classroom-based and independent learning environments. However, there are a number of critical issues that should be considered when approaching research in this field to ensure the research leads to theoretically valid, replicable outcomes. In this respect, cross-disciplinary understanding can play a crucial role in helping to advance the state of SRL in relation to FLL, and I believe it is instructional to look at psychological and educational research to gain perspectives on suitable practices for research. Another source for guidance on developing theory related to SRL is within the FLL field itself. Looking to more well established areas that share facets of inquiry, such as autonomy and self-directed learning in language education or the field of language-learner strategy research should also help clarify best practices for SRL research. With this in mind, in this paper I will outline what I believe are some of the main concerns that need to be considered when researching SRL and FLL. The discussion will touch on definitional issues related to self-regulation and SRL, matters of context, and debate regarding appropriate measurement. I will also look at one particular case within the area of language learning research that exemplifies some of the challenges involved in researching SRL. Finally, some suggestions for research approaches based on contemporary research into areas of language acquisition will be presented. However, before leading into discussion of definitional issues, it is perhaps useful to put forward a general definition of what I understand self-regulated learning, and the related concert of self-regulation, to be. While these definitions are not necessary for an understanding of the following, they may help clarify some of the points raised. Self-regulation refers to the capability of people to recognise and respond to context-situated behavioural, cognitive, or metacognitive cues, ideally modifying aspects of their functioning in the particular context to meet the needs signalled by these cues. Self-regulated learning refers to this process within academic settings, and is seen to be a learner capability that underlies and contributes, in either positive or negative ways, to learning outcomes. In a broad overview of some of the issues facing research into self-regulation published at the turn of the millennium, Zeidner, Boekaerts, and Pintrich (2000) called for the need for definitional clarity. They pointed out that a number of accounts of self-regulation shared a certain conceptual fuzziness, leaving unclear how self-regulation differed from other concepts such as regulation, self-management, problem-solving, or metacognition. They attributed this ambiguity to the overly-specialised and idiosyncratic use of definitional terms which has arisen from the development of modern behavioural science into somewhat compartmentalised sub-disciplines, and stated that “consistent nomenclature and taxonomy have been virtually impossible for many years because little coherence exists among theory and measures of self-regulation and other cognitive constructs” (Zeidner et al., 2000, p. 753). Five years later, Boekaerts and Corno were to write: “Over the past two decades, researchers have struggled with the conceptualisation and operationalisation of self-regulatory capacity, coming to the conclusion that there is no simple and straightforward definition of the construct of SR. The system of self-regulation comprises a complex, superordinate set of functions…located at the junction of several fields of psychological research” (2005, p. 200). Illustrating this is, for example, a special edition of the Educational Psychology Review devoted to delineating the concepts of metacognition, self-regulation, and self-regulated learning (Alexander, 2008). Here, Dinsmore, Alexander, and Laughlin (2008) reviewed 255 studies from 2003 to 2007 within the field of educational psychology that dealt with one (or more) of these concepts. They point out that although there is a “conceptual core binding the three constructs” (p. 404) they are not synonymous. Broadly speaking, theories of self-regulation focus on the important role of the environment in triggering regulation; metacognition focuses on the mind (cognition) of the individual, while self-regulated learning is concerned with academic learning (Dinsmore et al., 2008; Lajoie, 2008). However, reinforcing Boekaerts and Corno’s (2005) observation noted above, the findings reported by Dinsmore et al. (2008) showed a lack of clear definition and considerable overlap amongst these three concepts. Other findings show a lack of explicit definitions of SRL in reports of empirical research (Hadwin, Järvelä, & Miller, 2011), suggesting an assumption that those interested in the research will know what SRL is without it needing to be defined. Obviously this is not a desirable situation as this kind of conceptual laxness can cause confusion when trying to understand research results (Lajoie, 2008,) as well as contribute to inconsistencies in the results (Schunk, 2008). Given this issue of definitional clarity, it is perhaps not surprising that a number of models of SRL have been postulated, each reflecting a differing theoretical stance, and each of which present slightly different processes or stages learners pass through when engaging in learning tasks. Most contemporary accounts have three to four different stages or processes which self-regulated learners are posited to work through (see Zimmerman and Schunk (2001) for a comprehensive outline of various models). However, Zeidner et al. (2000) point out that models of SRL may require increased complexity to incorporate the dynamic nature of self-regulation. A further concern they raise regards the role of associated constructs such as self-efficacy and affect, and how they are related to self-regulation and SRL. We could extend this to ask the same of such constructs as beliefs, agency, interest, and imagination, all of which have recently been discussed in relation to second or foreign language acquisition (see, for example, Murray, 2014b; Navarro & Thornton, 2011), and all of which I believe are important factors in contributing to self-regulation. Self-regulation and SRL are not clean, clearly defined concepts. Approaches to understanding the complexity of both may not be successful if the focus of research is too broad, or alternatively, too narrow. As contributions to this issue have shown, it would also appear necessary to clarify the differences and points of convergence between self-regulation and constructs such as autonomy (Murray, 2014b; Nakata, 2014) or self-directed learning. Recognising how these are related, and the differences and similarities between constructs should serve to clarify research agendas as well as making the what and how of the research process more transparent. One reoccurring criticism that has been directed at SRL research has been a tendency to ignore the learning context and focus more on the individual or the self. While at first glance this may not seem to be a problem, given that SRL involves regulation of the self, the problem is that much research often fails to account for the possibility of co-regulation or other-regulation of learning, or for the effects on the learner of the learning environment. Martin (2003) states “much psychological research on self and agency has suffered from a failure to recognise the extent to which these important psychological phenomena are constituted within historical, sociocultural traditions of human life” (p. 36). Similarly, there has been a tendency for researchers to focus heavily on cognitive and behavioural aspects of self-regulation, treating social and affective dimensions as a background context rather than part of the process itself (Greeno, 1998). Martin and McLellan (2008) argue that many researchers studying self-regulation engage in psychologism, assuming (perhaps tacitly) that choices and actions of agents can be explained by reference to inner processes and states, underplaying the role of societal influences or interactivity with others. This is problematic in that it basically becomes tautological to discuss self-regulation, as regulation is seen to be located only within the self. Additionally, such issues as control over learning or regulation of learning through external sources are effectively removed from the research agenda, reinforcing and perpetuating the decontextualisation of self-regulation. It has been suggested that what is required are research approaches that measure SRL as context-dependant activity (Turner, 2006), and that research into self-regulated learning would benefit by taking into account the learner’s sociocultural environment (McInerney & Van Etten, 2004). Of course, most models of SRL include a social dimension, but there is still a need to clarify the differences between self-regulation, co-regulation, and socially shared regulation (Hadwin et al., 2011). Recent discussion suggests a refocusing of conceptual understanding in terms of the context of study to better account for the social, dynamic nature of the learning environment; for example Perry and Rahim (2011) cast a critical eye on the tendency of researchers to separate the learner and context, and outline how more research should be carried out in the classroom, giving greater attention to the perspectives of both the learners and the teachers. Consideration of context can happen at a number of levels. On one level, self-regulation is likely to vary for individual learners across academic domains, or across the same domain in differing classroom contexts (Wigfield, Klauda, & Cambria, 2011) so understanding the processes involved here is seen as one part of the research agenda. A broader level is in relation to culture, as in the cross-border sense. Much of the research into SRL comes from a western (predominately North American) context; to what extent are the findings from this research transferrable to other cultures? This is usually not addressed in studies into SRL in differing cultural contexts. While there does seem to be empirical support for viewing self-regulation of learning as an etic (universal) construct (McInerney, 2008), often the assumption seems to be that theoretical or research findings can be imported into different cultural contexts without major concerns for potential differences, i.e., without researching the possible emic (or cultural-specific) dimensions within the cultural context under study (McInerney, 2008; 2011). Further complicating matters is the nature of the research tools often used in studying SRL; McInerney (2011) argues that the reliability and validity of scales or inventories used in measuring self-regulation is compromised when they are adapted for use in studies outside of the cultural setting in which they were developed without additional validity or reliability checks for the new cultural setting. The point then, is that research into self-regulation needs to give increased consideration to the role of the sociocultural context of the learning situation. Furthermore, researchers need to be cognisant of the (inter- and intra-) cultural borders they are crossing and how this relates to the theoretical background of the research. This is reflected in recent discussion on other areas of language learning research. Witness recent volumes devoted to reconceptualising the place of the individual in applied linguistic (Benson & Cooker, 2013), considering the role of the self and second language acquisition (Mercer & Williams, 2014), and social dimensions of autonomy (Murray, 2014a), all of which offer insights that are applicable to researching SRL in the foreign language classroom. Along with changing conceptions of what self-regulation and its application by learners may entail, and where in the sociocultural milieu it is situated, a long-running debate relates to how it should be measured. This particular discussion revolves around whether self-regulation should be considered to be an aptitude or an event. When conceived as an aptitude, self regulation is seen as something relatively fixed and stable in the learner, developing over time and displaying considerable individual differences. As an event, it is seen as something that is more situationally determined, arising in response to particular demands of a learning task. One view advanced is that both qualities of SRL should be measured (Winne & Perry, 2000; Zeidner et al., 2000), i.e., it should be regarded as both an aptitude and an event, and that methods need to be developed for measuring SRL as both. However, a criticism of this suggestion brings up the issue of whether or not the models and solutions being suggested in this case are appropriate. Without knowing exactly what SRL entails (i.e., whether it is an aptitude or an event) it would seem somewhat premature to attempt to study it without the necessary conceptual understanding of what is being studied: “If the meaning of a particular concept, in this case self-regulation, is not clear, what is needed is not empirical research, but a clarification of the concept’s rules of correct employment” (Martin & McLellan, 2008, p. 439). It may sound like a facile point, but if self-regulation is to be researched, one needs to have a clear conceptual understanding about what is being researched, which brings us back to the need for definitional clarity. Assuming the researcher has developed a clear conceptual picture of what he or she understands SRL to be, differing measurement techniques are necessary depending on what exactly is being measured—an aptitude, or an event (Winne & Perry, 2000). If conceptualised as an aptitude, self-report methods of measurement often tend to be used; these include questionnaires, interviews, or teacher judgements. To measure as an event involves looking at learning in progress, through such methods as think-aloud measures, error-detection tasks, trace methodologies, and learner observation. Winne and Perry (2000), at the time of their assessment argued too little attention had been given to SRL as an event, something that may not have changed so much based on more recent overviews of research (Zimmerman & Schunk, 2011). Perhaps because of lower methodological hurdles, researchers have tended to measure SRL as an aptitude; but the results that have arisen out of this kind of research are questionable. Dinsmore et al. (2008) found that much of the research in their review utilised “self-report and Likert-type instruments [with] insufficient corroboration or collaboration of what individuals report they are thinking or doing with actual traces of such thoughts or behaviours” (pp. 405-406). One problem is the reliability of learner self-reports used in attribute-focused analysis: “Necessary as self-report data are, they are insufficient for research on SR and for helping learners develop more productive SRL” (Winne, 2005, p. 236). A similar argument is that researchers need to apply dynamic concepts and models to the area of SRL, using more sophisticated analytic techniques than those commonly deployed in previous research (Zeidner et al., 2000). Triangulation or mixed-method studies such as those covered by Tashakkori and Teddlie (1998) should be implemented, and longitudinal studies are especially needed (Zeidner et al., 2000). Boekaerts and Corno (2005) outline eight different assessment measures in their comprehensive discussion on SRL. Other than self-report questionnaires these include: behavioural observations; interviews; think aloud protocols; examining trace evidence; situational manipulations; recording of strategies “on-task”; and learner diaries. Obviously, each has its strengths and weaknesses, but with careful design and a mixture of techniques, these assessment measures seem to offer a way forward in successfully measuring different aspects of SRL. Overall, it seems that at least in the psychology and educational fields, “researchers have come to realise that the ultimate goal of comprehensive, insightful models of SRL depends upon a study of self-regulation while it is being generated” (Boekarts & Corno, 2005, p. 208, emphasis in original). Measurement needs to be focused on activity and participation of both learners and teachers in the actual learning environments (Perry & Rahim, 2011), using real-time event measures to avoid weaknesses of out-of-context (post-event self-reports, etc) measurements (Zimmerman, 2011). I think it is important to bring up one final consideration here, however. Measuring SRL as an event presupposes that learners have the capacity to self-regulate, but if they have not yet developed this capability within the learning context under study, devoting time and resources to trying to measure a non-existent event would seem somewhat counterproductive. Might it be better to use aptitude-based measurements to ensure learners have developed SRL capability before moving on to look at evidence of its actual application? I would argue this may be the case, and that there is a need to develop strong measurement tools and techniques to complement or replace the standard approaches that have been used in aptitude-based studies. Some of the most prominent discourse related to SRL in second/foreign language learning originates via Zoltán Dörnyei and colleagues’ critique of research into strategic language learning, and I believe this exemplifies a number of the issues covered in the preceding sections. This particular case revolves around the introduction of a model based on self-regulation which is intended to help overcome some of the problems that have plagued strategic learning research (Dörnyei, 2005; Tseng, Dörnyei, & Schmitt, 2006). Arguments for increased conceptual clarity arising from the psychological sciences notwithstanding, Dörnyei (2005) suggests that adopting the concept of self-regulation in place of learning strategies is helpful in overcoming issues of definitional clarity that have been problematic for learning strategy research. Tseng, et al. (2006) developed a scale they feel measures self-regulatory capacity, presenting this as an alternative to measures of strategic learning capacities. This particular scale, SRCvoc (Self-Regulating Capacity in Vocabulary learning scale) is theorised to measure self-regulation as a trait (or an aptitude, using the nomenclature introduced above). It is psychometrically based; a questionnaire designed to serve as a diagnostic tool to identify and understand learners’ strengths and weaknesses in terms of five dimensions of self-regulation in the areas of (English vocabulary) learning. (Tseng, et al., 2006). They make the important caveat that the scale is intended as a starting point for understanding learner self-reflection, and should be combined with qualitative methods. Their initial development and testing of this scale has since been validated in a Japanese EFL setting by Mizumoto and Takeuchi (2011). However, some controversy surrounds this particular development, not surprisingly from scholars interested in strategy research. Gao (2007) in response to Tseng, et al. brings up the previously mentioned issue of conceptual definitions, pointing out that metacognitive knowledge “could be a competing concept for the term ‘self-regulatory capacity’” (p. 617). Rose (2012) outlines how “definitional fuzziness” has been a problem for much of the research into language learning strategies, and notes that the model theorised by Tseng, et al. to replace strategic learning models is itself “suffering from the same definitional fuzziness” (p. 96) as the models it is aiming to replace. Another point, put forward by Ranalli (2012) argues that too much focus on Dörnyei and colleagues’ reconceptualisation has perhaps drawn the focus away from broader areas of self-regulation and other streams of related research found in the second/foreign language learning domain. Perhaps of more concern is Ranalli’s (2012) discussion of SRCvoc, and in particular the issue of the models of SRL used. Ranalli showed that empirical evidence from a study of self-regulated strategy use based on Winne and Hadwin’s COPES model of SRL (Winne, 2001) which conceptualises self-regulation as an event, provided substantially different results to account for student learning gains than Tseng, et al.’s (2006) trait (or aptitude)-based account. What to make of this particular situation? Tseng, et al.’s scale measures self-regulation as an aptitude or trait; it does not measure strategy use as an event in action (Rose, 2012). So it is only a first step towards understanding self-regulation, and in that it is attempting to create a new context-specific scale to measure self-regulation, perhaps a useful step. However, I also believe this particular case shows how the issue of definitional clarity needs to be treated carefully when attempting to link SRL and FLL, especially considering the substantial body of research surrounding other areas that SRL shares commonalities with. And of course, as I think Ranalli (2012) shows, there is also a need to be aware of alternative models and theoretical discussions to help guide research decisions. Within the language-learning field, self-regulated learning shares similarities with other concepts such as self-directed learning, metacognition, strategic learning, and learner autonomy, all of which provide a rich source of research models and practice providing useful guidance and suggestions on appropriate research directions when studying SRL. Oxford (2011) devotes considerable space to research with her Strategic Self-Regulation (S2R) model of language learning. In summarising the kinds of research that has been popular for those studying learning strategies, self-report is identified as a technique often used to uncover learners’ mental processes. The use of trace measures is also a common measurement technique, but something that needs to be complemented with interviews or some other form of assessment. Think aloud protocols (TAPs) are often presented as a useful method to assess how learners are using strategies or regulating their learning in real time. TAPs, or concurrent verbal reporting, involves having students verbalise their thinking as they progress through a learning task, with a delay of no more than 5-10 seconds, and are believed to provide a better record of how learners monitor and regulate their learning than post-event self-report measures (Greene, Robertson, & Croker Costa, 2011). Oxford (2011) points out the need to teach the learners how to actually use these kinds of protocols, with a standard technique involving modelling by the teacher/researcher. Of course, this raises the issue that when the learners actually use the modelling technique they may simply mirror what they learnt; one way to avoid this is to ensure the modelling session does not use the materials students will be working with in the classroom or research session. Pre- and post-task verbal reporting is another option for assessing SRL, where the subjects report what they plan to do before a task, and then retrospectively look back of the utility of the strategies they employed. Looking specifically at researching autonomy, Benson (2011) suggests action research is most suited for this particular field, something applicable to SRL, too. Useful approaches he suggests include introspective or retrospective accounts of learning gathered through diaries, written language learning histories, or interviews. In terms of looking at SRL as a state (event) it is useful to adopt a process-based analysis, one possible approach to this is “through observations involving video-recording and transcription of learning events, but diaries, interviews and stimulated recall can also be useful techniques” (Benson, 2011, p. 207). Larsen-Freeman and Cameron (2008) introduce a number of methodologies suitable for studying language development as complex dynamic systems; if we can assume that SRL is itself a dynamic system then perhaps these methods could also be applied to the study of SRL. Student self-assessment in the form of portfolios is both a useful way to measure SRL progress, as well as to encourage successful development & implementation, as demonstrated by an early study of self-regulation and language development by Donato and McCormick (1994). What is crucial for this kind of approach is active feedback and reflection on the portfolio contents from both teachers and learners. Their research was informed by a sociocultural perspective, and in fact perhaps some of the most promising research directly related to SRL and second or foreign language learning comes from researchers adopting a sociocultural framework. This is especially so as the focus shifts more towards the co-regulation or other-regulation of the self in SRL. A case in point is Bown and White (2010), who demonstrate how qualitative methods can be used in measuring particular dimensions of control in self-regulation; in this case, the regulation of affect, an important if little-studied part of self-regulation. They used a small sample size of just three subjects, relying on interviews for their data collection. While they acknowledge limitations of their approach, they see a process-based approach as most appropriate for understanding this particular facet of the learner. Finally, an analysis of self-directed learning (SDL) by Pemberton & Cooker (2012) is of particular interest as a case study of an alternative research methodology applicable to varied research contexts; Q methodology. This is a research tool which avoids fundamental weaknesses of standard psychometric approaches (Stainton Rogers, 1995) yet one which helps researchers to empirically identify factors contributing to learner processes, from a shared or holistic perspective, or from the individual’s perspective: “Q enables the researcher to harness subjective notions in a methodical way, embracing both the rigour of statistical analysis and the richness of verbal data” (Pemberton & Cooker, 2012, p. 215). The authors note that, to their knowledge there have been no other published cases of applied linguistics research using Q methodology; certainly as far as this author is aware, nothing in relation to FLL and SRL. One hopes that this particular case does not become an anomaly. Self-regulated learning is still a relatively under-researched area in relation to foreign language learning, but it offers a complex, broad range of research possibilities. As a learner capability that underlies and contributes, in either positive or negative ways, to learning outcomes, and which seems to vary considerably across learners and learning contexts, the challenges involved in advancing understanding of SRL processes are quite considerable. But at the same time, these challenges are what will ideally help make this a vibrant area of research in the near future. While the points raised in this paper are somewhat board, and not necessarily restricted to the study of SRL, it is hoped they will provide some guidance for those interested in exploring this concept, and contributing to a clearer understanding of the relationship between self-regulated learning and successful outcomes in foreign language learning. Paul Collett has been teaching at the university level for the majority of his 24 years in Japan. Along with self-regulation, his academic interests include research methodology and epistemology, and learner and teacher motivation. Benson, P. (2011). Teaching and researching autonomy (2nd Edition). London, UK: Longman. Benson, P., & Cooker, L. (Eds.). (2013). The applied linguistic individual. Sheffield, UK: Equinox. Dörnyei, Z. (2005). The psychology of the language learner: Individual differences in second language acquisition. New York, NY: Routledge. Greene, J. A., Robertson, J., & Croker Costa, L-J. (2011). Assessing self-regulated learning using think-aloud methods. In B. J. Zimmerman & D. H. Schunk (Eds. ), Handbook of self-regulation of learning and performance (pp. 313-328). New York, NY: Routledge. Hadwin, A. F., Järvelä, S., & Miller, M. (2011). Self-regulated, co-regulated, and socially shared regulation of learning. In B. J. Zimmerman & D. H. Schunk (Eds. ), Handbook of self-regulation of learning and performance (pp. 65-84). New York, NY: Routledge. McInerney, D. M. (2008). Cultural differences and cultural identity in self-regulated learning. In D. H. Schunk & B. J. Zimmerman (Eds. ), Motivation and self-regulated learning: Theory, research, and applications (pp. 369-400). New York, NY: Routledge. McInerney, D. M. (2011). Culture and self-regulation in educational contexts: Assessing the relationship of cultural group to self-regulation. In B. J. Zimmerman & D. H. Schunk (Eds. ), Handbook of self-regulation of learning and performance (pp. 422-464). New York, NY: Routledge. McInerney, D. M., & Van Etten, S. (Eds.). (2004). Big theories revisited. Greenwich, CT: Information Age. Mercer, S., & Williams, M. (Eds.). (2014). Multiple perspectives on the self in SLA. Bristol, UK: Multilingual Matters. Murray, G. (Ed). (2014a). Social dimensions of autonomy in language learning. Basingstoke, UK: Palgrave. Oxford, R. L. (2011). Teaching and researching language learning strategies. London, UK: Longman. Pemberton, R., & Cooker, L. (2012). Self-directed learning: Concepts, practice, and a novel research methodology. In S. Mercer, S. Ryan & M. Williams (Eds. ), Psychology for language learning: Insights from research, theory and practice (pp. 203-219). Hampshire, UK: Palgrave Macmillian. Perry, N. E., & Rahim, A. (2011). Studying self-regulated learning in classrooms. In B. J. Zimmerman & D. H. Schunk (Eds. ), Handbook of self-regulation of learning and performance (pp. 122-136). New York, NY: Routledge. Stainton Rogers, R. (1995). Q methodology. In J. A. Smith, R. Harre & L. Van Langenhove (Eds. ), Rethinking methods in psychology (pp. 178-192). London, UK: Sage. Wigfield, A., Klauda, S. L., & Cambria, J. (2011). Influences on the development of academic self-regulatory processes. In B. J. Zimmerman & D. H. Schunk (Eds. ), Handbook of self-regulation of learning and performance (pp. 33-48). New York, NY: Routledge. Winne, P. H. (2001). Self-regulation viewed from models of information processing. In B. J. Zimmerman & D. H. Schunk (Eds. ), Self-regulated learning and academic achievement: Theoretical perspectives (2nd Edition) (pp. 153-189). Mahwah, NJ: Lawrence Erlbaum. Winne, P. H., & Perry, N. E. (2000). Measuring self-regulated learning. In M. Boekaerts, P. R. Pintrich & M. Zeidner (Eds. ), Handbook of self-regulation (pp. 531-566). San Deigo, CA: Elsevier. Zeidner, M., Boekaerts, B., & Pintrich, P. R. (2000). Self-regulation: Directions and challenges for future research. In M. Boekaerts, P. R. Pintrich, & M. Zeidner, (Eds. ), Handbook of self-regulation (pp. 749-768). San Diego, CA: Elsevier. Zimmerman, B. J. (2011). Motivational sources and outcomes of self-regulated learning and performance. In B. J. Zimmerman & D. H. Schunk (Eds. ), Handbook of self-regulation of learning and performance (pp. 49-64). New York, NY: Routledge. Zimmerman, B. J., & Schunk, D. H. (Eds.). (2001). Self-regulated learning and academic achievement: Theoretical perspectives (2nd Edition). Mahwah, NJ: Lawrence Erlbaum.